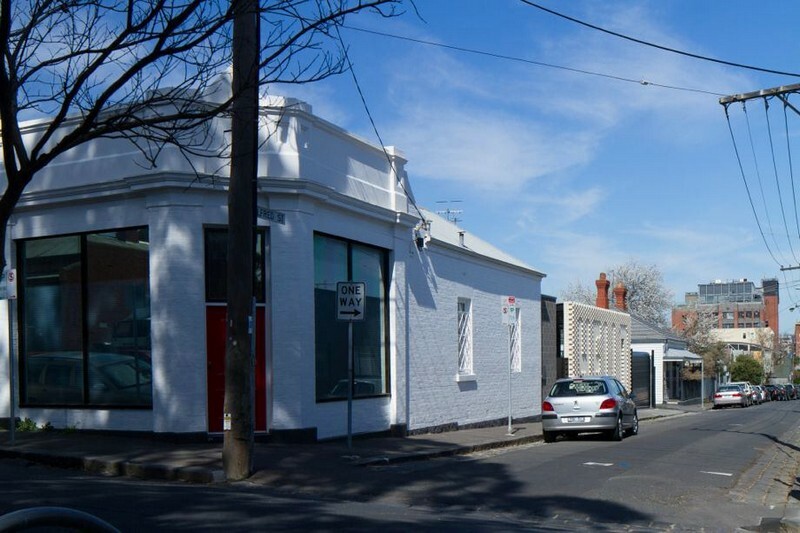 We believe that common people passing by this quiet street in Melbourne suburbs usually slow down their pace to enjoy this welcoming house. 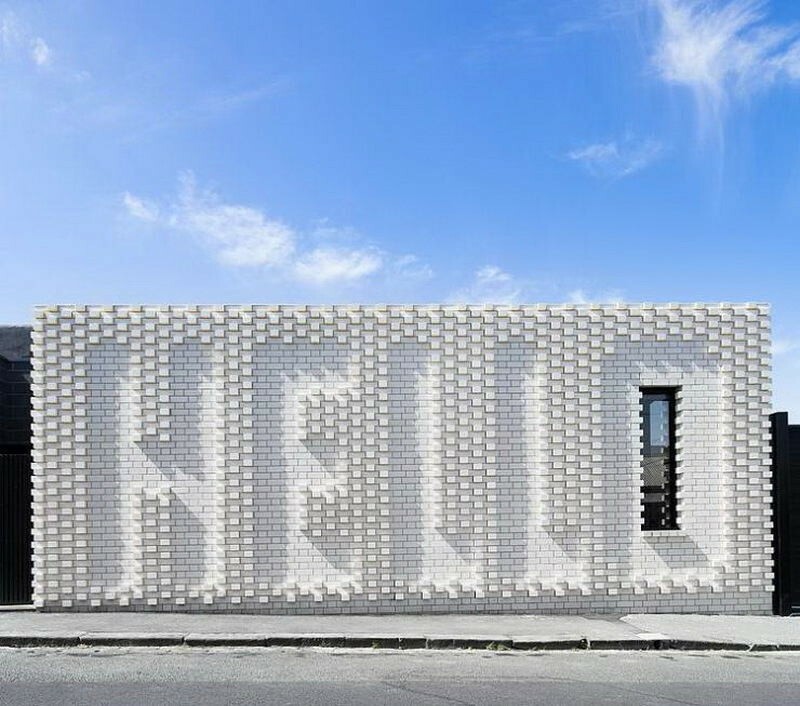 It’s welcoming in the truest sense of the word, since the bricks on its exterior wall make up the word “Hello” with a narrow window fit into the “o”. This house accommodates a studio and an apartment of young spouses, who are open for fresh ideas and passionately in love with their neighborhood, which represents a picturesque blend of the buildings of the 19th century, tiny warehouses and blocks of apartments constructed in the 1960-70s. The “Hello” house has perfectly fit into the surroundings and undoubtedly pleased the neighbors. Perhaps, you would agree that very few of us think about the way our house would blend with the architecture of the neighborhood or at least the street it stands on. Failing this, we forget about the harmony of the space and just hide behind tall fences. 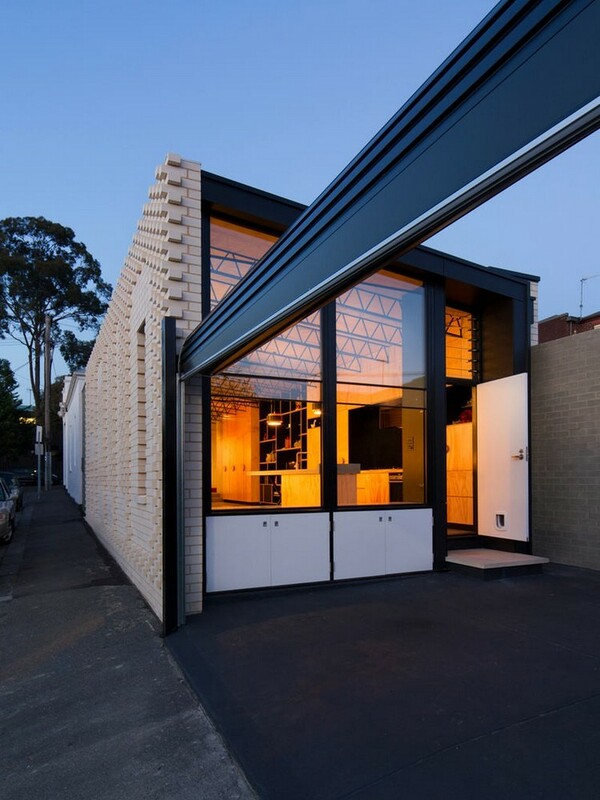 But why not make a fence an integral part of an interesting house concept? As for the privacy issues, the project found a golden mean between the interests of its inhabitants and observers. As a matter of priority a giant shop window, which wouldn’t give the masters any chance for privacy, was bricked up. On the next stage the bedroom and bathroom were providently shifted to the remote part of the territory. And a convenient garage door isolated the inner yard from the street. 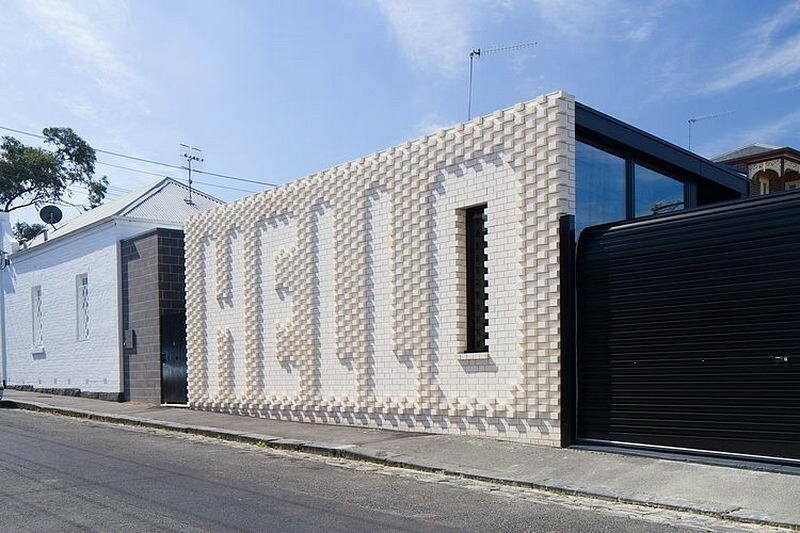 The idea with the “Hello” brickwork makes up for the fact that the house is hidden from the sight of passers-by – now it literally invites you to pay attention to it and slow down. Its author is a famous Australian artist Rose Nolan, while the rest of the house was created by the OOF! Architecture Studio. 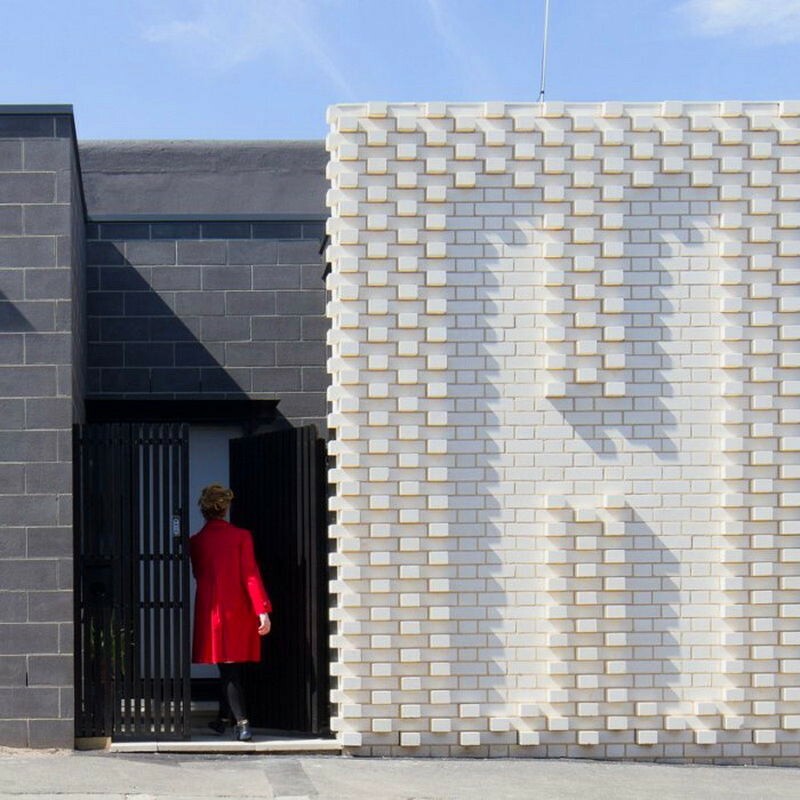 So, what does the extraordinary exterior conceal inside? From the very beginning it should be mentioned that the masters preferred to invest in well thought-out-design and skills of furniture makers instead of building materials. 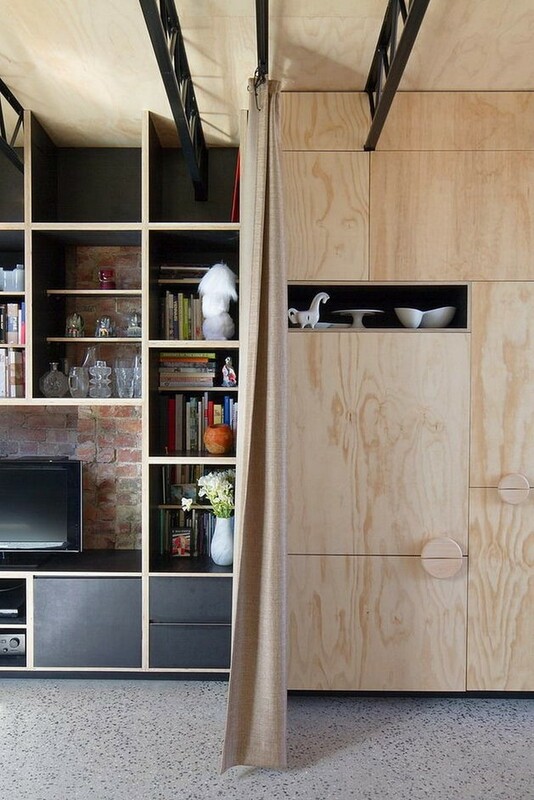 That is why rooms finished with plain veneer and brick masonry look so stylish. The combination of industrial dark metal ceiling constructions and light gray polished concrete flooring makes the loft concept of the interior cozy. A neutral color scheme, open-plan layout and panoramic windows work together to create a light and airy space. Besides, according to the hosts, the air in their house circulates so perfectly that they never feel too hot in summer or cold in winter. 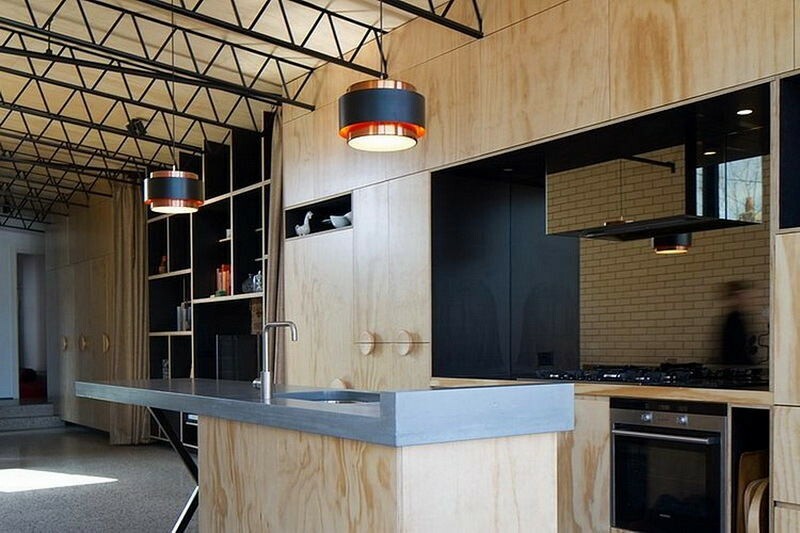 Veneer was used in wall and ceiling finishes and as the main material for cabinets, wardrobes and a kitchen island. Why did this idea appear to be so practical and relevant? 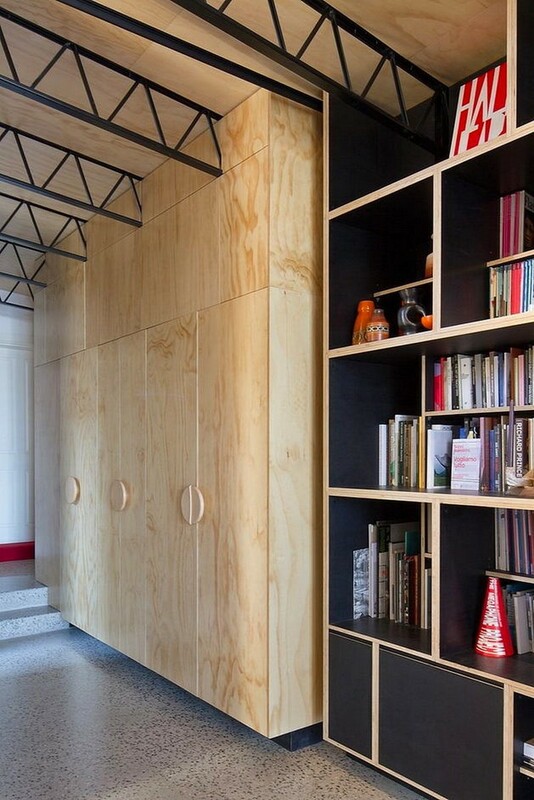 The thing is that veneer and plywood are very easy to process – they are both solid and flexible. Every pattern is one-of-a-kind, created by the nature and that’s why you’d never accuse veneer of being dull and monochrome. To crown it all, such design is eco-friendly and very airy. Given that the hosts have creative jobs, gloss and prestige of their interior were the least of their worries. 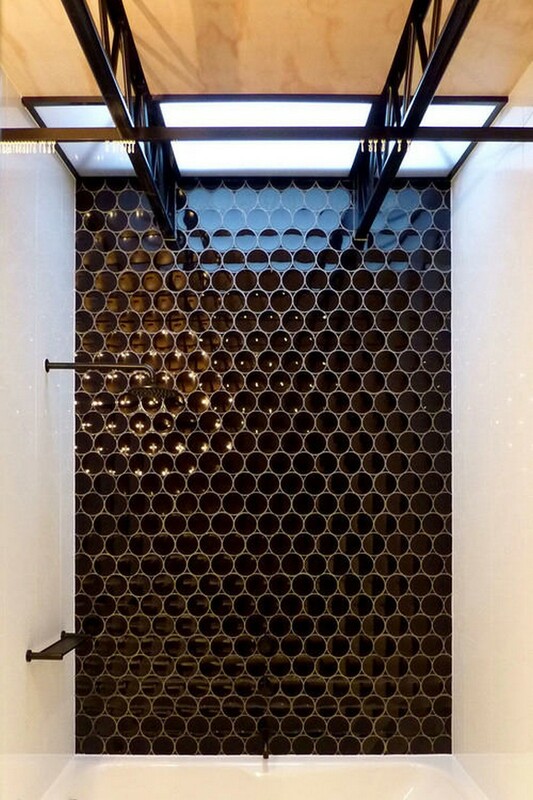 What they needed was a chance to play around with unusual textures. 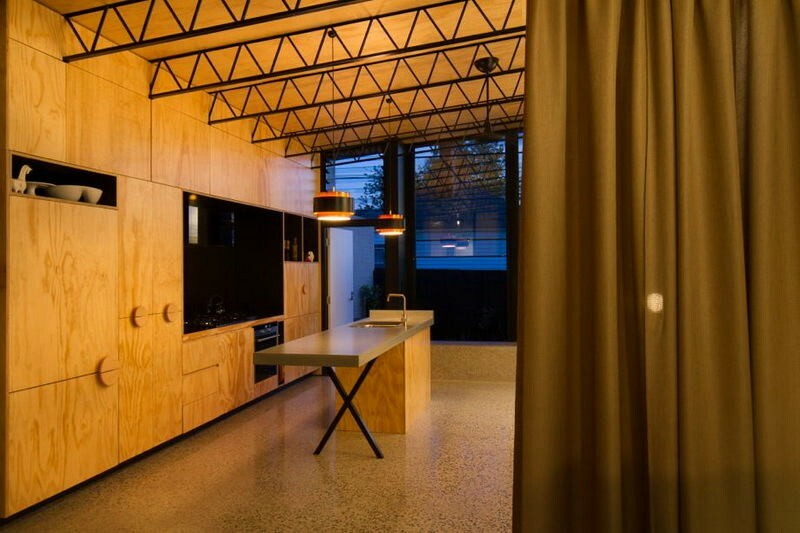 One more non-standard material – polished concrete floor – perfectly blends with light wood and dark metal finishes. By the way, all the surfaces are easy-to-clean – the makers coated them with special compounds that retard moisture and mud. We all are got used to seeing walls separating lounge zones from prep areas, but in such an elongated space a wall would make one claustrophobic, and hence there’s just a beige linen curtain zoning the room. It allows for changing scenarios between intimate family time spending and hospitable home parties. Authentic brickwork behind open racks creates a spectacular background for books, souvenirs and all that stuff. 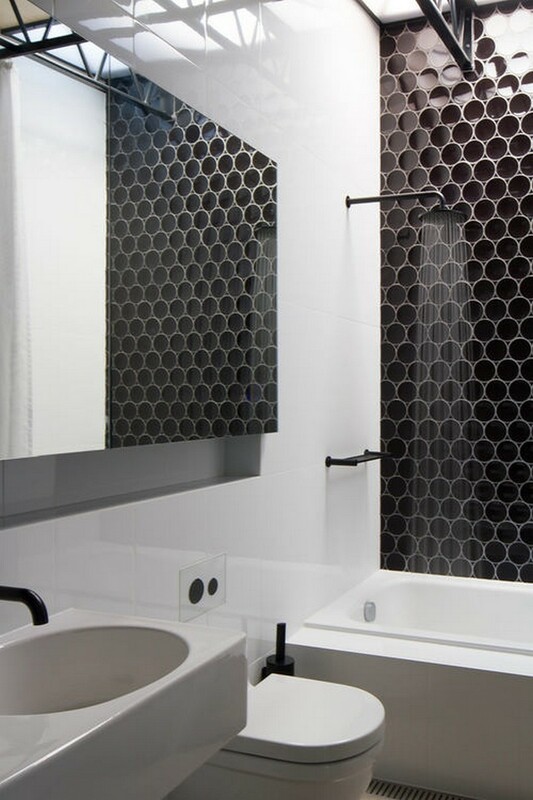 Matte white walls of this contrasting bathroom interior are balanced with the glimmer of black wall tiles. A shower head and a faucet are also non-white, which wouldn’t let metal inserts interfere with the austere graphics of the design. A big mirror creates the sense of spaciousness. And of course, veneer is also here – it’s used in ceiling décor to add some warmth and lightness to the laconic interior. The project of the “Hello” house was being implemented within 5 years due to the clients’ life circumstances. 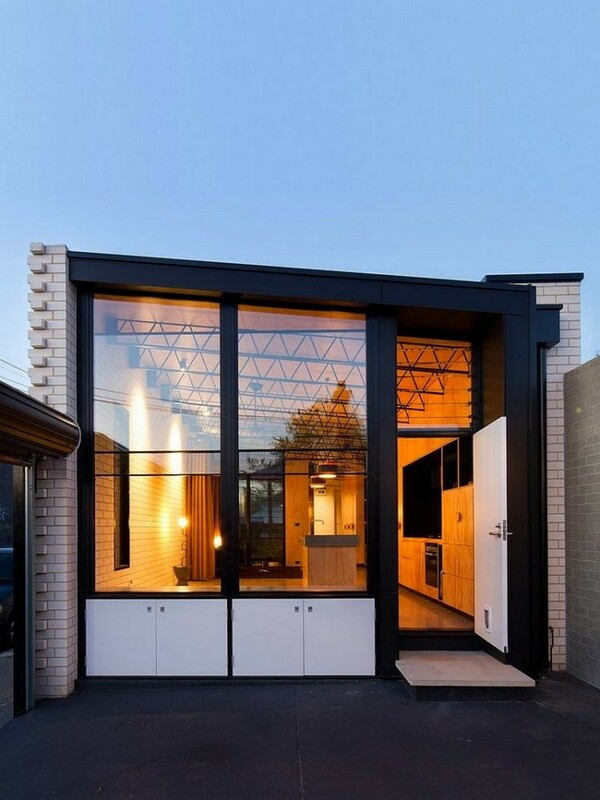 But the result appeared to be a great combination of exterior and interior beauty and bold and practical solutions, which made this house not only comfortable for its inhabitants, but also enjoyable for the entire neighborhood.